The HPWD crew went back into the field on Thursday, July 30, 2015, but this time to learn about potatoes. 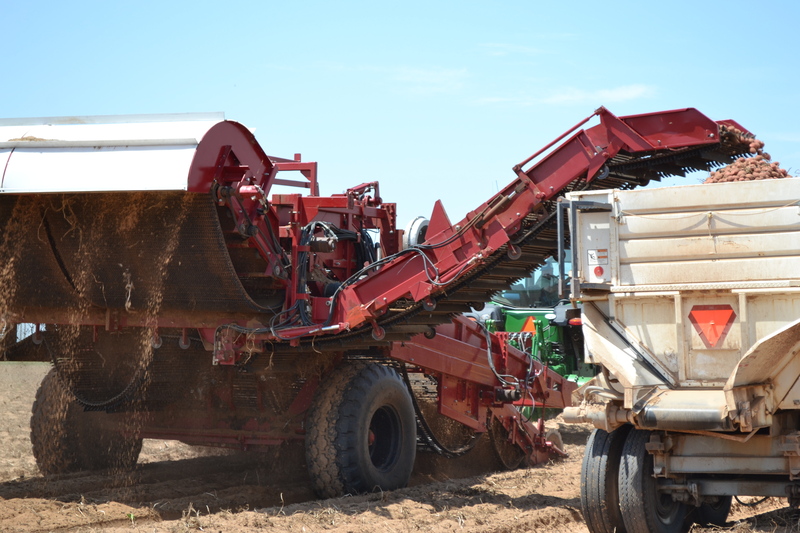 The 2015 Annual Potato Field Day was hosted by Springlake Potatoes, Inc., Barrett Farms, and the Texas A&M AgriLife Research Department of Horticultural Sciences. The day was filled with sunshine, sand, a tour of the Springlake Potatoes, Inc. processing and packing facility, several potato research plots and lunch prepared by Grandaddy’s Authentic BBQ of Muleshoe, Texas. The potatoes are on the conveyor belt that will take them inside the packing facility to the Odenberg Machine for sorting. The first part of the tour was through the processing and packing facility. Here, the HPWD crew saw where the potatoes are unloaded out of the trailers onto a conveyor belt. At this point, the potatoes are rinsed and trash and debris are hand-picked out. Afterward, the water drains to a collection pond where it is later reused to irrigate grass for cattle. Once the trash and debris are gone, the potatoes run through an Odenberg Machine which sorts them based on set criteria such as size, color and skin imperfections. Potatoes that grade No. 1 continue on in the packing process. The potatoes are then sorted by human eye one last time before they are packaged to ship. The potatoes are shipped to many different places including several Texas locations, Chicago, New York and Canada. Some Springlake potatoes can even be found at various United and Walmart Supercenters. 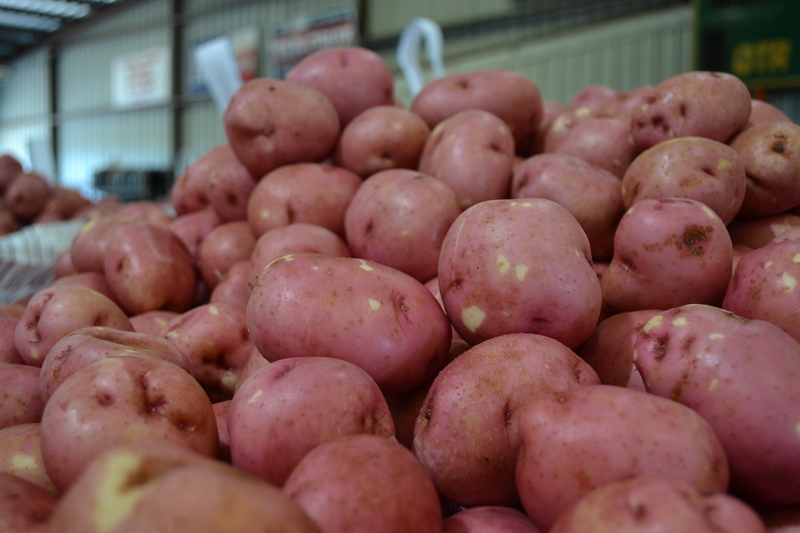 In one year, over 50 million pounds of potatoes are produced by Springlake Potatoes, Inc. Following the tour through the processing and packing facility, the HPWD crew got their hands dirty in the potato fields. In the fields, the HPWD crew saw over 200 different research plots. 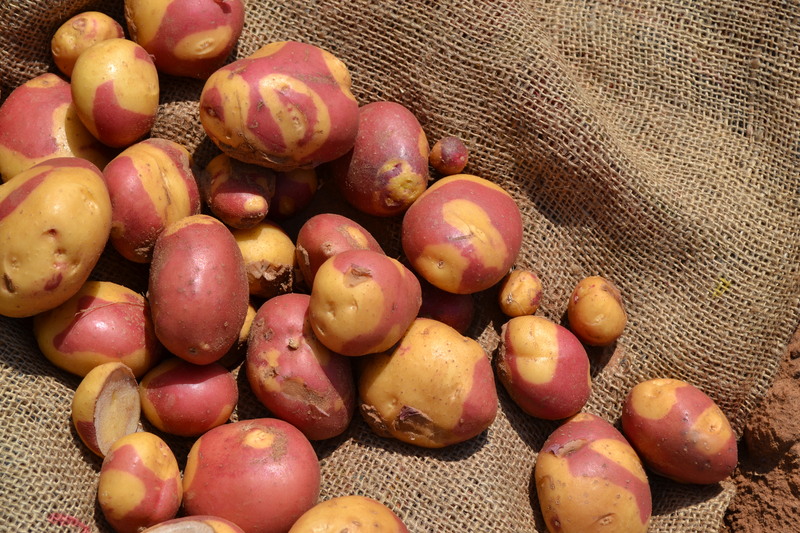 The potato research plots included different varieties of traditional red, yellow and russet potatoes as well as several trial varieties. 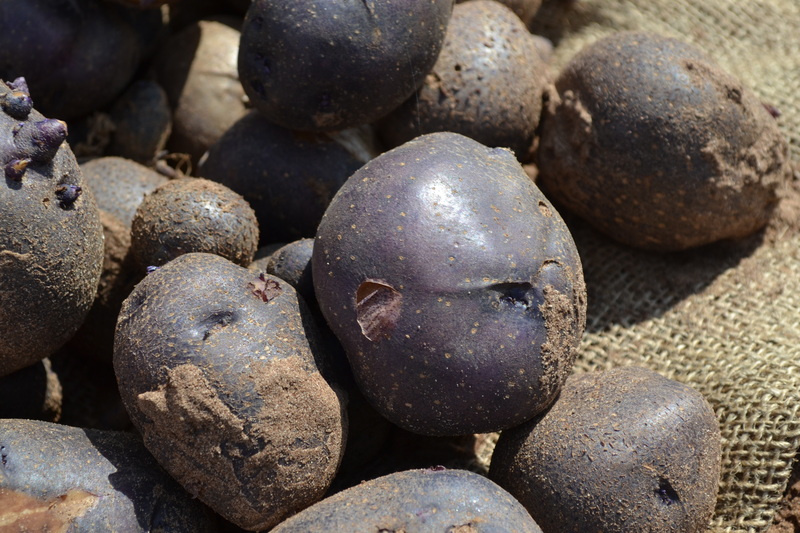 Some of the trial potatoes included purple, pinto, banana and peppermint potatoes, which are not yet available in-store. These pinto potatoes are part of the research potato trials. After visiting the research plots, the HPWD crew visited a potato field that was being harvested. Here the HPWD crew learned that seeds are planted approximately one foot in the ground. When it is time for harvest, a tractor with dull blades digs the potatoes out of the ground and gently shakes the dirt loose. 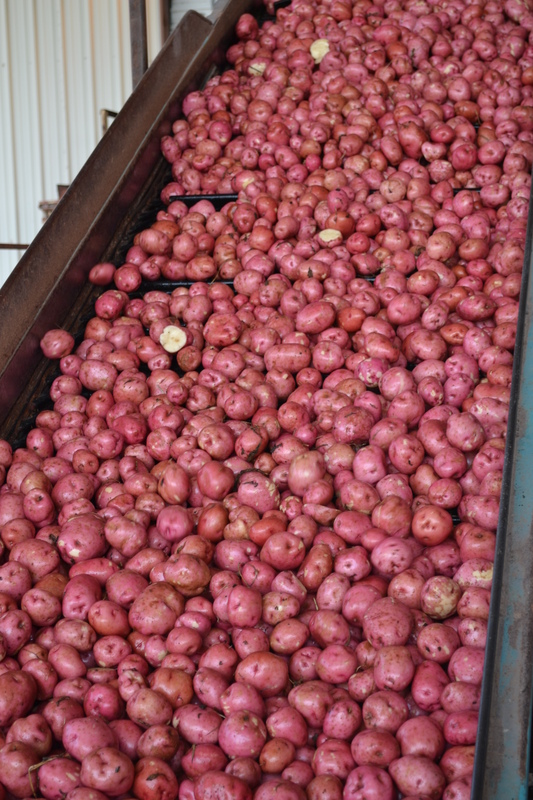 The potatoes then travel up a conveyor belt and into a truck that transports them to the processing facility. “We want the potatoes to be treated as gently as possible,” said Steve Barrett, grower and family member of Barrett Farms. Barrett also served as the tour guide for the HPWD crew. The potatoes are grown on an average of 40 acre fields and the usual harvest time is three days. Harvest is in full swing at Springlake Potatoes, Inc. Finally, the HPWD learned about the technology that Springlake Potatoes, Inc. is using to make their production methods more efficient. These technologies include smartphone applications to monitor and control pivots, iPads connected to pivots and GPS equipped tractors. By using an application to monitor and control their pivots, Springlake Potatoes Inc. can track exactly which pivots are in use. They can also turn the pivots on or off from a touch of a button on a smartphone or iPad. GPS equipped tractors allow for a constant speed in the field during both planting and harvesting which produces a better quality potato. The HPWD crew received a great tour at the field day and learned a lot. Thank you Springlake Potatoes, Inc. and Barrett Farms for hosting the fun and educational potato field day! These purple potatoes are part of the research potato trials. These potatoes have been sorted and now await packaging.